I think they're great, especially the patchy bits by my knees. The weekend was pretty mundane: on Saturday we went out and bought some "stairgates". I've no idea what they're for and they don't look like much: they just appear to be large boxes made of cardboard, but Mum and Dad obviously feel better for getting them. Sunday was a bit better: I went to Church with Mum and then after lunch we all went to see Aunty Cheryl. It was good to see her, and I had a great time trying to bash her cats. 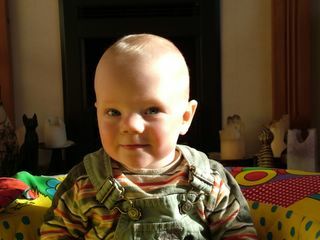 On Monday, Mum and me went to see my mate Ewan at Aunty Claire's house. Ewan was very pleased to see me (I could tell because he patted me a lot), and I spent a lot of time chewing on his toys. We stayed for lunch, and I ate very tidily until saw Ewan tucking into a huge Petits Filous! 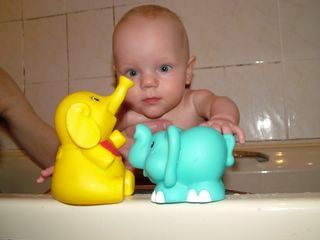 I didn't know they came in pots that big: perhaps this explains why Ewan is so large! Mum and Dad suddenly started to talk about things called "stairgates" this week. I can do sitting up a lot better now, and from a sitting position I can grab any toys that are around me. However, sometimes I try and grab a toy that's a bit too far away. Sometimes I end up on all fours when this happens, and from there I try to rock backwards and forwards, which I think is hilarious. I'm not sure what happens next, but I think it's going to be exciting. Mum and Dad say that if I'm going to be poorly, it'll be on a Thursday or Friday because they both have to work on those days. My Childminder was quite excited last week as there was a fighing chance that I'd make it to her four weeks in a row, but it wasn't to be. I've had a nasty cold and cough that's been getting steadily worse for a few days now, but last night I coughed so much that I was sick, quite a lot. It was a long night for all involved, and we were all a bit tired this morning, so Mum and Dad thought it would be best if I stayed home today. I've done a lot of sleeping today, and I was feeling a bit better by bedtime. It's competition time! 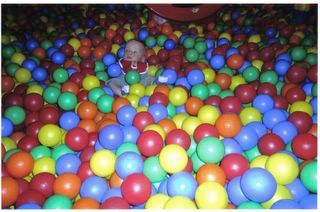 My lovely Childminder took a photo of the ball pool we went to see last week. Can you find me in it? (Dad says that if you need a hint, you should try following the trail of balls with dribble on them). Saturday was a beautiful sunny day, so Mum and Dad took me for a walk Roath park. However, it wasn't a normal walk, as Mum and Dad kept running off! One of them would stay and push the pram for a bit (there where lots of birds and swans and things), while the other would go running off round the lake. Mum said it was all part of her New Year's resolution to get fit, but it looked like a lot of hard work to me. Mum has been especially brave since I've moved to my new cot. 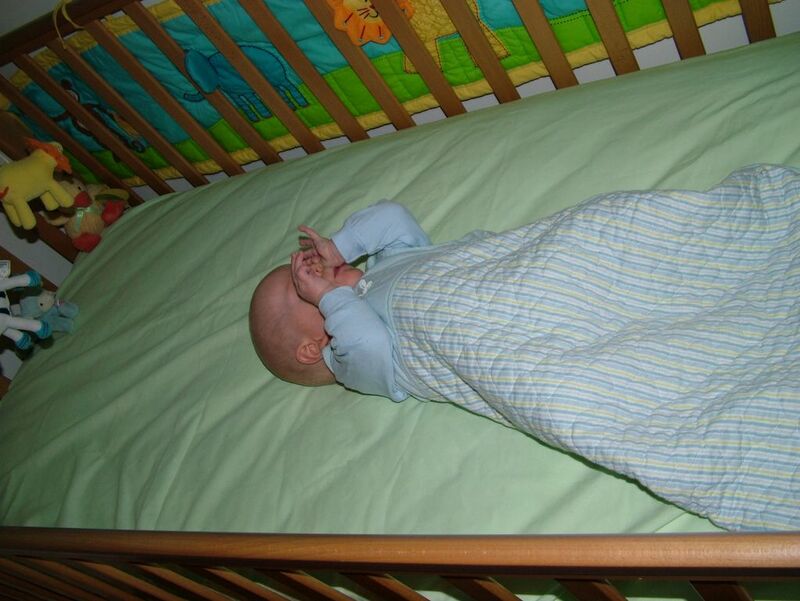 I used to have a sensor under the matress in my old cot to monitor my breathing, but the new cot gives me so much wriggle-room that there's no way it could pick up the signal. So we had to turn it off. Mum has been very brave (although she still has the sound monitor). My latest trick is blowing rasberries. It's taken a lot of coaching from Dad, and a lot of early morning practise, but I've finally got it sussed. I think it's quite funny, especially if someone does it back to me when I do it to them. 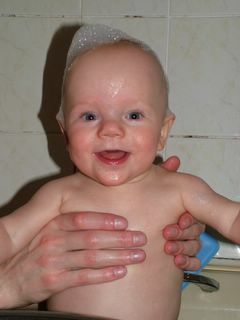 And it's really good for getting Mum and Dad out of bed in the morning (it sounds really funny through the monitor). 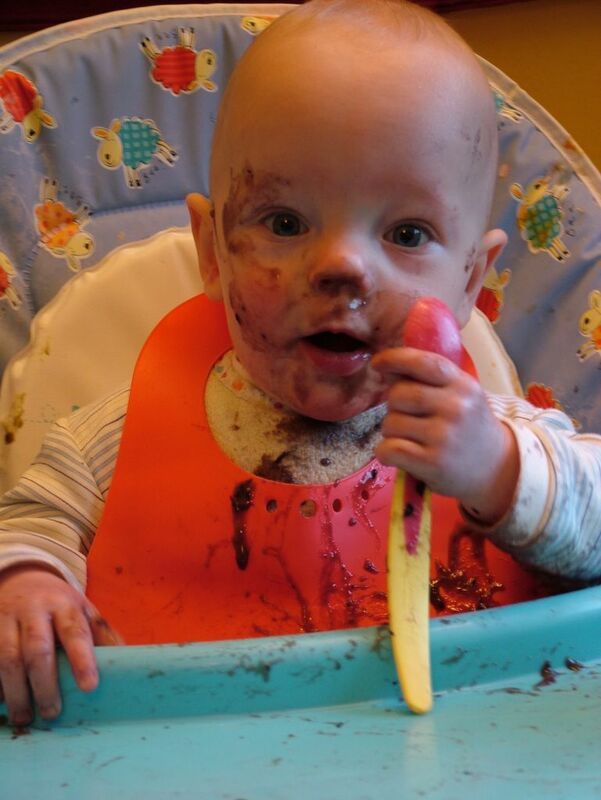 However, my favourite thing is to rasberry my food all over the person feeding me. If you want to try this at home, Petits Filous is probably your best bet: it's got just the right consistency for wide coverage and good splatter. Finally, I thought I'd better update you on my weight: I'm now 14 pounds 8 ounces! That's not bad for someone who was 1 pound and 14 ounces just under a year ago. Nana and Grandpa came to see me on Saturday. They arrived at tea time, and I was very tired; I was so surprised to see them that I burst into tears! But I quickly calmed down when I realised who they were. They looked all tanned and relaxed: Dad explained that they'd been on holiday to see Uncle Dave in Thailand. It was good to see them. On Sunday, Dad and Grandpa spent ages moving things around in my room. 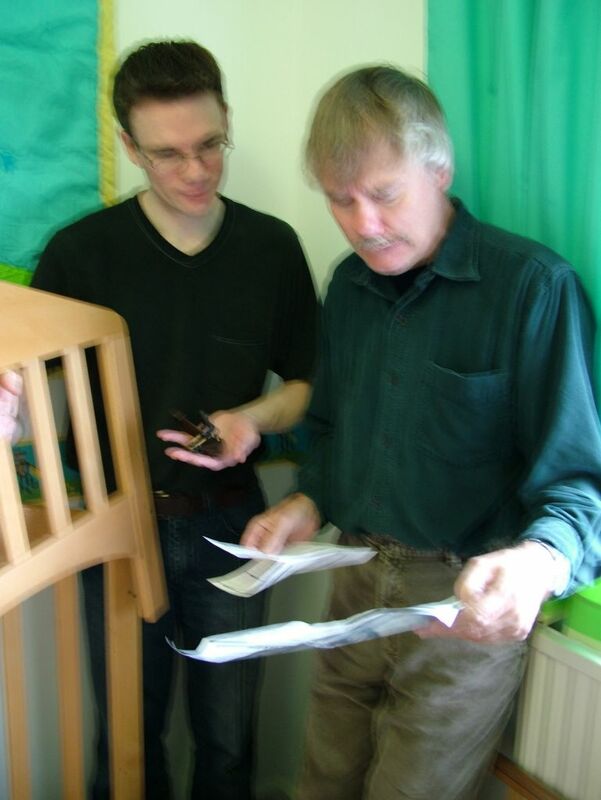 When I went to see what they were up to, they were puzzling over a collection of wooden bits. Mum explained that it was a cot from Aunty Lou and Thomas, but it didn't look much like a cot right then. They did manage to put it all together eventually. It's really comfortable: I had a good long sleep in it after lunch, and I went straight to sleep in it at bedtime. Thankyou very much to Aunty Lou and Thomas for lettimg me have it! When I woke up on Wednesday, I felt like something was missing. But I didn't work out what it was until Mum and me went downstairs: Dad wasn't there! usually, he makes bottles and breakfast while I get Mum out of bed, but today Mum was on her own. I was worried for a bit, but it turns out that he had gone off to London with Work the night before. However, we coped very well without him although Mum did try to feed me Cottage Pie for breakfast and Porridge for lunch by mistake. Anyway, Dad seemed very pleased to be home when he got back in the evening: I think he missed not seeing me in the morning. I had a great time at the Childminder's on Friday: we went to a Wacky Warehouse! It had a very exciting pool full of coloured plastic balls that you can go in without having to get undressed first. I spent a lot of time bouncing up and down in the balls, watching all the other children playing and chewing everything I could get my hands on: it was great! I was really tired by the end of it all though, and nearly fell asleep in my dinner. 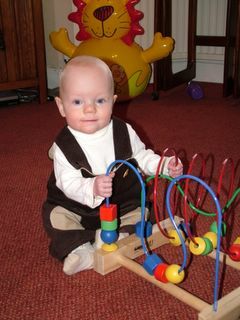 I had lots of fun at my Childminder's on Thursday and Friday. I showed her my sitting up (I can do it really well until I get distracted by me feet or The Mog), and I showed her my crawling (well, I've got the arm action all figured out, but I've yet to work out what I should do with my legs: they keep getting in the way). On Saturday we all went swimming. I showed Dad all the things I've learnt at my swimming classes: we all had great fun doing the actions to the "Wheels on the bus". 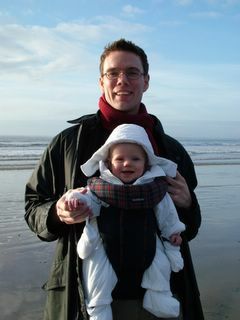 We didn't stay too long because it was pretty cold and both Dad and I go blue in cold water. But it was good fun. When we were all done playing in the waves, we called in to see Uncle Pete and Aunty Liz for a quick cup of coffee. I was quite pleased to see them despite being a bit frightened by Poppy, their very cute puppy. I was captivated by their Christmas tree. On Tuesday, we went swimming and then Mum took me to be weighed. I'm now 13 pounds 14.5 ounces, which means that I've put on nearly a pound over Christmas! Dad says I'm starting to look a bit chubby, and that it must be all those Christmas dinners I've been eating. Happy New Year!. Today is the start of 2006, and I want to give my biggest smile to one and all. I'm not too clear on why we need a new year (Dad says that we've need a new one because we used up all the days in the last one), but everyone seemed to be very pleased to see the end of the old one: all the fireworks at midnight woke me up! Anyway, 2005 turned out to be rather busy for me and my family. I wonder how 2006 will turn out?